The Nature Observatory of Amazonia (NOA) situates itself on the banks of the Amazon River, projecting itself from its vast waters into the depths of the rainforest itself. Providing a pier and convenient pausing point for many travellers travelling along the river, NOA naturally becomes a curious destination for visitors. A long tilted volume dissects through the many rich layers and structures of the rainforest, exposing its visitors to the wide breadth of natural biodiversity. 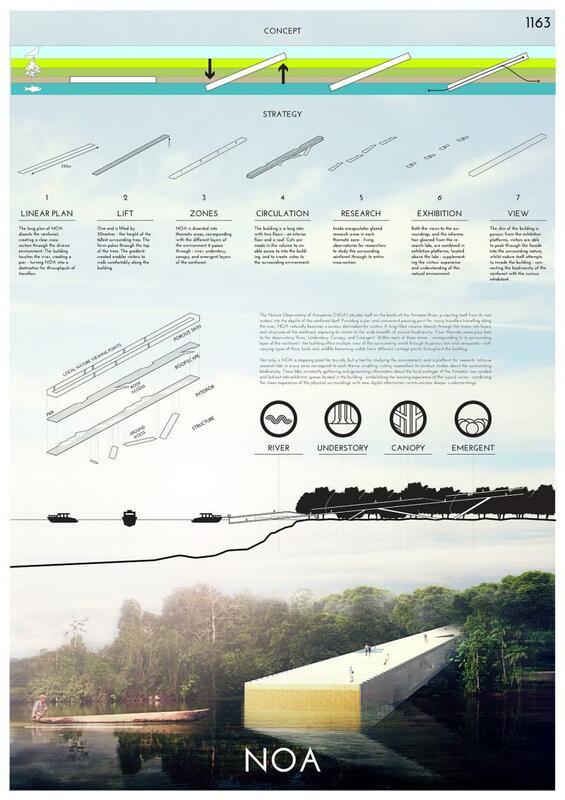 Four thematic areas play host to the observatory; River, Understory, Canopy, and Emergent. Within each of these zones - corresponding to its surrounding layer of the rainforest - the building offers multiple view of the surrounding world through its porous skin and viewpoints - with varying types of flora, birds and wildlife becoming visible from different vantage points throughout the building. Not only is NOA a stopping point for tourists, but a tool for studying the environment, and a platform for research. Inhouse research labs in every zone correspond to each theme, enabling visiting researchers to conduct studies about the surrounding biodiversity. These labs, constantly gathering and generating information about the local ecologies of the Amazon, are curated and fed out into exhibition spaces located in the building - embelishing the learning experience of the typical visitor - combining the sheer experience of the physical surroundings with new digital information communicates deeper understandings. It is an excellent proposal! Simple and neat! Congratulations! ¡Felicidades por la propuesta! Me gusta la resolución de la misma con un gesto claro y sencillo, que ofrece muchas posibilidades al programa de usos propuesto. ¡Genial!